The seventh annual University Conference will take place from 8 a.m.-5 p.m. Feb. 7. The Conference is an opportunity for the entire University community to review and collectively address key issues affecting the future of the University and its ability to provide students with the best possible opportunities to learn and develop their talents both inside and outside the classroom. This year the event’s objective is to encourage discussion and input from all areas of the University community related to becoming more focused on the learning process and what hinders and aids this process. Classes will not meet from 7:30 a.m.-5:30 p.m. Feb. 7, giving students and faculty the opportunity to attend the event. Registration will begin at 8 a.m. outside the Ophelia Parrish Performance Hall, where light refreshments will be served. Garry Gordon, vice president for academic affairs, will give opening remarks and an introduction in the OP Performance Hall at 8:30 a.m. The first two of the day’s four sets of concurrent sessions will discuss Tagg’s and other’s ideas with multiple presentations on various topics. The first session begins at 10 a.m., the second set is scheduled for 10:50 a.m. Lunch will begin at 11:45 a.m. in the Student Union Building Lounge, during which Tagg will deliver the 2007 Baldwin Lecture, “In the Beginning...” In his lecture he will explore recent research capturing the nature of expertise, with the provocation that experts are good beginners. A break is scheduled for 1:30 p.m., after which an overview of Truman’s Strategic Plan is scheduled to take place at 1:45 p.m. in the OP Performance Hall. At this time, participants are also welcome to visit the Technology Fair in the Student Union Building Activities Room. See the Technology Fair article for more information about what will be on display at the Fair, which will run from 1:45-5 p.m. The final two sessions will follow. The third set of session, beginning at 2:45 p.m. will include a focus on the University’s Strategic Plan. The fourth, beginning at 3:30 p.m., will concern the different majors and disciplines that Truman offers. The Conference will conclude with a Conference Social held in conjunction with the Technology Fair at 4:30 p.m. in the SUB Activities Room. This time will allow participants to socialize and reflect on the day’s activities. Visit http://vpaa.truman.edu/communications/universityconference/2007/ for a complete itinerary of the events for the day. Contact Julie Lochbaum, director of the Center for Teaching and Learning, at ctl@truman.edu or 785.4391 for more information on the Baldwin Lecture. A limited number of copies of Tagg’s book are also available in the Vice President for Academic Affairs office, McClain Hall 203. Many projects will be on display and two Dell all-one-printers will be awarded at this year’s Technology Fair. The Teaching Learning Technology Roundtable (TLTR) is hosting the Fifth Annual Technology Fair from 1:45-5 p.m. Feb. 7, the afternoon of the University Conference, in the Student Union Building Activities Room. The Fair will showcase both exciting ways that technology can facilitate the educational process as well as innovative ways that technology is already being used at Truman. The topics that will be covered include, among others, creating an e-textbook, tailoring an online simulation game for use in courses, with audiovisual and textual resources to enhance the reading of a literary work, using an online “wiki” Web site to compile class resources for use by different instructors, developing an online mathematics curriculum for use in K-12 education, and the latest from Instructional Design Services led by Diane Richmond, the new instructional designer. In addition, the winners of the TruTech Challenge, a competition of technology projects open to students, faculty, staff, classes and organizations, will be awarded Dell printers in a ceremony at 4:30 p.m. The Technology Fair will conclude in conjunction with the University Conference’s social hour, during which refreshments will be served. Contact Chad Mohler at chmohler@truman.edu for more information about the Fair or TLTR. Pictured front row, left to right: Jamie Matthews, Brooke Hamilton, Jill Scognamiglio, Nohemi Alvarez-Landa, Rep. Rebecca McClanahan, Teresa Kerbawy, Shanna Foster and Miriam Savabi. Second row, left to right: Amanda Groebl, Laura Halfmann, Loretta Palmer, Maddie Schill, Kristen Overson, Meagan Batson and Megan Hasse. Third row, left to right: Josh Kelly, Keith Trivitt, David Bonner, Michael Landrum, Cari Brummit, Jaret Copeman and Rachel Goldammer. Fourth row, left to right: Zach Monroe, Steven Webb, Christopher Peterson, Sean Lowery, Adam Gouge and Ryan Hart. 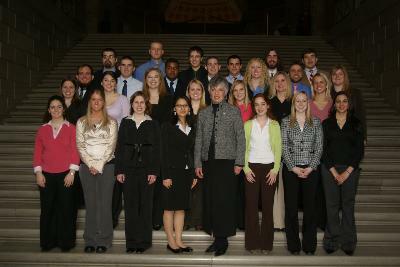 The University took 27 students to Jefferson City Jan. 31 to present their research to Missouri’s legislators. The poster presentations were part of Truman’s Capitol Appreciation Event. Students in Kirksville received an early lesson on spending habits. On Jan. 23 and 25, Truman’s Students in Free Enterprise team (SIFE) organized a project titled “SIFE Savings” at the Adair County Family YMCA. This two-day event, designed for third- and fifth-grade children, included a discussion and a game focused on the difference between impulse and smart buying. As part of the game, students were asked to make decisions about buying situations. They were also asked to keep track of their transactions in a savings register. At the end of the game the participants received prizes based on how much they had saved, thus demonstrating the consequences of poor spending choices. SIFE is a global nonprofit organization represented by student teams on more than 1,600 university campuses in 40 countries. SIFE offers students the opportunity to develop leadership, teamwork and communication skills through learning, practicing and teaching the principles of free enterprise. Each year SIFE competitions take place worldwide, paying tribute to the education outreach projects. Contact Jeni Long, Truman’s SIFE president, at jll707@truman.edu or 314.973.0977 or visit their Web site at http://sife.truman.edu for more information. February is Black History Month and Truman State University will celebrate through competition, food, political discussion, film, music, dance and fashion. The month kicks off with the Black History Knowledge Bowl at 7:30 p.m. Feb. 8 in Baldwin Hall 156. Team sign ups will take place Feb. 5-8. The Soulful Sunday Dinner will take place at 5 p.m. Feb. 11 in the Ryle Hall Main Lounge. People can feed their mind, body, and spirit with a nourishing home cooked meal. The event is free, but there is a limited quantity of food. The next event helps people to enrich their mind by listening to a presentation by KC Morrison at 6 p.m. Feb. 12 in Magruder Hall 1098. Morrison is a member of the doctoral faculty of political science at the University of Missouri-Columbia specializing in the areas of Third World politics, African politics and society, African-American politics and society, and comparative political leadership. He is scheduled to discuss “Race Cycles and the 2008 Elections” with a focus on two-party politics in the United States. a discussion concerning the issues illuminated by the film and its content. The month wraps up with a cultural explosion with “Sights and Sounds of Africa.” This event will celebrate African culture through food, dance, fashion and more at 4 p.m. Feb. 25 in the Student Union Building Lounge. This is event is sponsored by the African Student Association, the Residential College Program and Multicultural Affairs. All events are sponsored by the African Student Association, Association of Black Collegians, Multicultural Affairs Center, Phi Beta Sigma Fraternity, Inc. and the Residential College Program. The Morris K. Udall foundation is expected to award 80 scholarships of up to $5,000 to sophomore or junior undergraduates who have demonstrated a commitment to the environment. The campus deadline for this nationally competitive scholarship is Feb. 27. For more information visit the Udall Web site at http://www.udall.gov/ and contact Maria Di Stefano, Truman’s Udall Foundation representative, at mdistefa@truman.edu. The Point Foundation has announced the availability of numerous scholarship opportunities for lesbian, gay, bisexual and transgender students. The Point Foundation hopes to provide a greater level of acceptance, respect and tolerance within future generations for all persons regardless of sexual orientation, gender expression or gender identity. Visit http://www.thepointfoundation.com for more information about the foundation’s scholarship opportunities. Visit http://vpaa.truman.edu/communications/universityconference/2007/ to view the complete schedule of events. James N. Giglio, distinguished professor emeritus of history of Missouri State University, will present this lecture. Contact Mark Hanley at 785.4089 or ss04@truman.edu for more information. Blue Key members urge the public to participate in this upcoming Red Cross blood drive. This is the organization’s second blood drive of the academic year. The Red Cross will be signing-up walk-in donations the day of the event. The Truman State University Bulldog football team will be having a signing social event beginning at 4 p.m. Feb. 8 in the Student Union Building Conference Room. KTVO Sports Director Fred Beck will provide a welcome at 4:15 p.m. Jerry Wollmering, Truman’s director of athletics, will speak at 4:20 p.m. Shannon Currier, head football coach, will speak at 4:25 p.m. followed by the 2007 Bulldog Signing Class Highlight Show at 4:35 p.m. There will be free appetizers and beverages. The Truman football staff thanks faculty and staff for all of their efforts in helping recruit the signing class. The Health Awareness Fair will offer free blood pressure screenings, BMI calculations, HIV screening (from 1-6 p.m. in the SUB Activities Room) and other free prizes. Additional health information and support groups will also be on hand. E-mail nursing@truman.edu for more information. This free event is sponsored by the Nursing Student Association in conjunction with the Health Awareness Fair. Visit http://www.devonharrislive.com for more information on the speaker. On the Career Center’s Web site, http://career.truman.edu, find the Career Expo link and click on it. There students will find a helpful list of companies who have signed up thus far as well as a student registration link where students can sign up ahead of time. It is recommended that they sign up before Expo as it will save them a lot of time waiting in line the actual day of Expo. Feb. 14 is the last day to apply online for jobs with companies that will be conducting on-campus interviews Feb. 22. The Career Center will sponsor “Map Out Your Future” Feb. 20 which includes employer mock interviews all day. Students can sign up now in person for employer mock interviews but they will need to turn their résumé in at the same time they sign up. And as always, the career assistants are available, without appointment, to assist students with their résumé and cover letter questions. Stop by the Career Center or call 785.4353 for more information. The Office of Admissions is looking for applicants who are responsible, energetic and sincere in their desire to relate all aspects of University life to perspective students and their families. The Student Ambassadors are a group of approximately 150 students whose goal is to promote Truman State University to prospective students and their families. They are in charge of visiting with prospective students, giving tours of campus and assisting with visit events. Applications are available in the Office of Admissions, McClain Hall 205. Interviews will be conducted Feb. 19-23. Contact Jill Graves at jgraves@truman.edu for more information. Captains’ Meeting: Feb. 22 at 4:30 p.m.
Share your opinion about the Truman Web site by taking the Web usability survey at http://redesign.truman.edu. While you’re there, stay updated and involved in the process through the Web Redesign Committee’s blog. Your comments and suggestions are welcome as we redesign the Truman Web site for the fall semester. Marijke Breuning, associate professor of political science, has been awarded a Ping Fellowship to support her participation in the CIEE (Council on International Education Exchange) International Faculty Development Seminar in Ghana summer of 2007. Matt Tornatore, associate professor of foreign language and linguistics, had his article concerning the disputed origin of several Italian Gallicisms published in the most recent issue of “Rivista italiana di linguistica e dialettologia” (Rome, Italy) pp 175-190. The Truman campus was covered in red on Feb. 2 for National Wear Red Day. Karen Skoch, director of fitness/wellness programs, thanks those Truman students, faculty and staff that participated in helping to raise awareness and raise money in support of the American Heart Association’s research and educational efforts for Adair County. Special thanks to the SERVE Center, Janice Young and HES Health 440 Students, the Student Health Center, and SRC volunteers for planning and implementing activities on campus. Special thanks to the female athletic teams for helping support Wear Red Day. Also, a special thank you to Tim Barcus for taking photographs of the events. It is never too late to get involved and learn more about preventing heart disease. February is the month to love your heart. Schedule your heart health check up today. Applications are now being accepted for Le Coin français, Truman’s French language residence community, and La Casa Hispánica, Truman’s Spanish language residence community. These communities will be housed in Missouri Hall beginning in fall 2007. Applications are due Feb. 9. For more information or to receive an application, contact Tim Farley at tfarley@truman.edu for Le Coin français and Carol Marshall at carolmar@truman.edu for La Casa Hispánica. Upward Bound has several summer job openings including instructional, residential, media and other positions. Application packets with résumés, transcripts and references are due Feb. 16 in Kirk Building 220. Go to http://ub.truman.edu or call 785.4244 for more information. Applications for the Sue Shear Institute for Women in Public Life’s 21st Century Leadership Academy are now available at http://registrar.truman.edu/other/shear.html and are due Feb. 23. The Academy is a weeklong, residential college program that encourages students to consider careers in public policy, and provides leadership skills training. Applicants must be currently enrolled, degree-seeking students who have expressed interest in women’s public policy leadership, and will be returning to Truman for the fall 2007 semester. Contact A. Kay Anderson, registrar, at 785.4143 or aka@truman.edu for more information. The Truman Bookstore is having a sale on Jones & Mitchell hooded sweatshirts until Feb. 17. The sweatshirts, normally priced at $49.98, will be selling for $34.99. The Bookstore is located on the ground floor of the Student Union Building. Book releases by Truman authors in February will be available at the Truman Bookstore. The new books include “An Illusion of Harmony” by Taner Edis, “Plunging to Leviathan?” by Robert Graber, and “Founding the Future: A History of Truman State University” by David Nichols. Visit http://truman.bkstore.com/ for additional author titles. Contact Steve Pennington at 785.4211 for more information. John Tagg, author of “The Learning Paradigm College,” will speak at a Baldwin Lecture and Luncheon in conjunction with the University Conference at 12:30 p.m. Feb. 7 in the Student Union Building Lounge. Tagg’s interactive lecture is titled “In the Beginning...” He will also be speaking at a follow-up lunch Feb. 8 in the Student Union Building Alumni Room from noon-1:30 p.m. Those wanting to attend the follow-up lunch should R.S.V.P. by Feb. 6 to Julie Lochbaum at ctl@truman.edu or 785.4391. ACEI will meet from 8:30-9:30 p.m. Feb 7 in Violette Hall on the upstairs couches. The organization promotes the education and development of young children. Cookies will be provided. Contact Arianna Downard at ahd232@truman.edu for more information. Janick-Buckner will speak on the topic of “Preparing for Graduate School: M.A.E., M.S., Ph.D., M.D.Ph.D. - Is it for me? How do I get there?” Come and engage in a lively discussion on all things graduate school. CIAO is having a study abroad meeting for those interested in studying abroad in Italy at 7 p.m. Feb. 8 in West Campus Suites 100. Contact Gina Ribaudo at gmr588@truman.edu for more information. The Career Center is hosting SCORE mock interviews from 10 a.m.-2 p.m. Feb. 9 in the Career Center. Retired professionals who are members of the Service Corp. of Retired Executives (SCORE) will be conducting mock interviews with one-hour time slots. Upperclassmen who are actively applying to graduate or career schools or searching for a job are encouraged to attend. Prior sign-up, résumé and professional attire are required. Contact Polly Matteson at 785.4240 or pollym@truman.edu for more information. Are you flexible? Join people from 5:30-6 p.m. Feb. 9 in the SRC Aerobics Room for an interactive workshop demonstrating proper stretching techniques and highlighting the benefits of stretching prior to physical activity. Stretching 101 will be offered by the SRC Fitness/Wellness Program and HES Health 440 Students. Questions and one-on-one assistance will be from 6-6:30 p.m. Contact Karen Skoch at 785.7739 or kbskoch@truman.edu for more information. Hillel is hosting an Israeli dancing night from 7-9 p.m. Feb. 9 in Baldwin Hall 252. No experience is necessary and refreshments will be provided. Contact Anna Horowitz at avh657@truman.edu for more information. Runners and walkers of all abilities are welcome to join members of Truman’s women’s soccer team in a 2.6 mile minimarathon at 11 a.m. Feb. 10 in front of Pershing Building. All proceeds go directly to nonprofit organizations that fight disease and poverty in Africa. Suggested donations are $25. For more information or to register, contact Emily Huyck at ehuyck@truman.edu or 785.7260. Blue Key Spring Recruitment begins at 4 p.m. Feb. 10 in the Student Union Building Activities Room. Attendance at the event is required forall men who are interested in going through recruitment. Contact Joe Baumann at jab035@truman.edu for more information. The Center for Teaching and Learning is sponsoring a Global Issues Colloquium from 7-9 p.m. Feb. 15 in Magruder Hall 1000. Contact Julie Locbaum at ctl@truman.edu or 785.4391 for more information. Phi Kappa Phi is having a group lunch for Truman’s staff, faculty and student Phi Kappa Phi members at 11:30 a.m. Feb. 19 in the Student Union Building Alumni Room. Those who wish to attend should R.S.V.P. to Wynne Wilbur at wwilbur@truman.edu or at 785.4435 by Feb. 12. Phi Kappa Phi members are also welcome to drop by the meeting as their schedule allows.